Here is some video from Jaime Schwartzwald from Friday's game against Nebraska Omaha. Former Nanook goaltender Chad Johnson was called up to the New York Rangers on Thursday from the Hartford Wolf Pack, New York's AHL affiliate. New York Rangers President and General Manager Glen Sather announced today that goaltender Chad Johnson and defenseman Ilkka Heikkinen have been recalled from the Hartford Wolf Pack of the American Hockey League (AHL), and goaltender Steve Valiquette has been assigned to Hartford. Johnson, 23, has appeared in 18 games with Hartford this season, posting a 10-6-1 record with a 2.10 goals against average, .926 save percentage and three shutouts. He is currently tied for second in the AHL in shutouts, fifth in wins, eigth in save percentage, and ninth in goals against average. Johnson registered a season-high four-game winning streak, beginning with his first career AHL shutout on October 31 against Providence to November 7 at Bridgeport. He also notched back-to-back shutouts on November 13 vs. Manchester (26 saves) and November 14 at Worcester (35 saves). The AHL rookie made his debut with Hartford on October 9 at Providence, and recorded his first AHL win the following game on October 10 against Springfield. Prior to joining Hartford, Johnson appeared in 79 games over four seasons with the University of Alaska-Fairbanks of the Central Collegiate Hockey Association (CCHA), posting a 25-34-11 record with a 2.33 goals against average. Last season, he earned CCHA Player of the Year and CCHA Goalie of the Year honors, and was named to the CCHA First All-Star Team after establishing career-highs in wins (14), goals against average (1.66), save percentage (.940) and shutouts (six) in 35 appearances. Johnson was also selected to the NCAA West All-American Second Team, and was a top ten finalist for the Hobey Baker Award as the top player in collegiate hockey. The Calgary, Alberta native was originally the Pittsburgh Penguins’ fifth round selection, 125th overall, in the 2006 NHL Entry Draft. He was acquired by the Rangers on June 27, 2009, in exchange for a fifth round selection (Andy Bathgate) in the 2009 NHL Entry Draft. Heikkinen, 25, has skated in 24 games with Hartford this season, registering five goals and 11 assists for 16 points, along with eight penalty minutes. He is currently tied for fifth among AHL defensemen in goals, sixth in points and ninth in assists. He also ranks second on Hartford overall in shots (54), fifth in points, and is tied for second on the team in shorthanded goals (one), third in assists and seventh in goals. Heikkinen has recorded four multi-point performances on the season, including two multi-assist efforts. He tallied a point (assist) in his AHL debut on October 3 at Binghamton, and notched his first career AHL goal on October 11 at Providence. The Rauma, Finland native skated in 283 career SM-liiga games with Lukko and HIFK over six seasons prior to joining Hartford, registering 31 goals and 82 assists for 113 points, along with 255 penalty minutes. He finished last season ranked third among all SM-liiga defensemen in points (34) and led HIFK defensemen in goals (eight), assists (26) and points, while finishing second on the team overall in assists, fourth in points and seventh in goals. In 2007-08, he established SM-liiga career-highs in goals (11), assists (26), points (37), and penalty minutes (96). Heikkinen signed with the Rangers as a free agent on May 20, 2009. Valiquette, 32, has appeared in six games with the Rangers this season, posting a record of 2-3-0 with a 3.74 goals against average, .852 save percentage and one shutout. He registered his fourth career shutout with an 18-save effort in his season debut on October 11 against Anaheim. What is on his mask? The CCHA did a nice video of Nanooks goaltender Scott Greenham about what his mask is all about. You can watch the video via this link or go to the CCHA site. 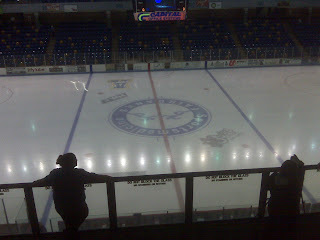 Here are the highlights from the Nanooks 4-4 tie with Northern Michigan. 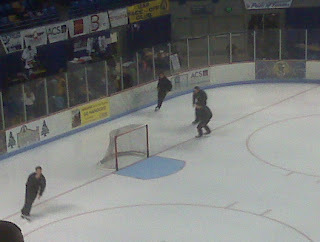 The Nanooks also took home an extra point in the standings by winning the shootout. Nanooks goaltender Scott Greenham was named the CCHA goaltender of the month for October. 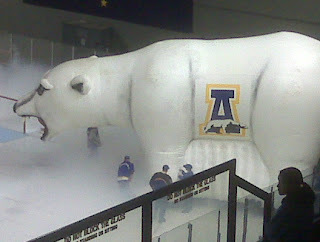 Here is the release from the Alaska Nanooks site. FARMINGTON HILLS, MI — The Central Collegiate Hockey Association announced today that Alaska Nanooks sophomore goaltender Scott Greenham (Addison, ON) has been named the RBC Financial Group CCHA Player of the Month for October. This is the first time Greenham has earned the honor in his career. Greenham, a 22-year-old from Addison, Ontario, led the Nanooks to a 5-0-1 record in October and leads the CCHA in winning percentage (.917), save percentage (.949) and goals-against average (1.14). His goals-against average ranks second in the nation and first among goaltenders to record more than 100 minutes. In addition, Greenham ranks sixth in Division I in save percentage and second among netminders who have faced more than 100 shots on goal. The 6-foot-2, 197-pound sophomore has been named CCHA Goaltender of the Week two times through the first four weeks of play. Greenham was the first player to receive the honor after being named Most Outstanding Player in the Kendall Hockey Classic Oct. 10-11. He allowed just one combined goal in wins over then-No. 4/3 Michigan (2-0) and Mercyhurst (5-1) with a total of 43 saves. Greenham was recognized a second time after allowing just three goals, two of which came on the power play, during Alaska’s home sweep of Ferris State, Oct. 30-31. Special mention for RBC Financial Group CCHA Player of the Month honors goes to Bowling Green freshman forward Jordan Samuels-Thomas, Ferris State senior forward Blair Riley, Lake Superior senior forward Zac MacVoy, Miami sophomore goaltender Cody Reichard, Michigan junior forward Matt Rust, Michigan State junior forward Corey Tropp, Nebraska-Omaha junior forward Rich Purslow, Northern Michigan junior forward Mark Olver, and Notre Dame senior defenseman Kyle Lawson. The RBC Financial Group CCHA Rookie of the Month is Michigan State's Derek Grant, who is tied for first in the nation in scoring among rookies with 10 points, including four goals and six assists. 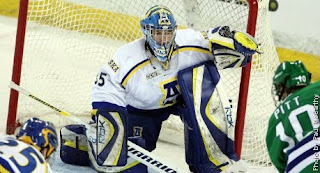 Alaska Nanooks right wing Andy Taranto (Woodridge, IL) earned special mention for CCHA Rookie of the Month for October. Taranto has two goals and four assists in six games for the Blue and Gold. 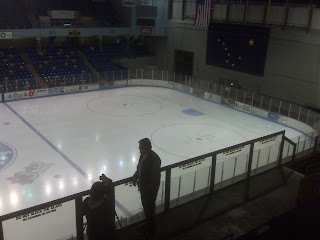 Jaime Schwartzwald brings us some more video action of the Alaska Nanooks and their thrilling 3-2 overtime victory over Ferris State. Hit the Jump to read the game stories of the Nanooks two wins on the weekend. The Alaska Nanook volleyball team snapped a five-match losing streak by defeating the Central Washington Wildcats 3-2 Saturday night at the Patty Center. The Nanooks clawed back from a 9-6 deficit in the fifth set to capture their first win in a month and improve their record to 9-12 overall and 3-7 in the GNAC. The Nanooks fell behind early in the first set 5-0 but responded with a 5-point run of their own to tie the set at five all. The Nanooks out hit the Wildcats .235-.143 but could not close out the set as Central Washington went on a 4-1 run after the score was deadlocked at 21. Alaska continued their strong play in the second set as they raced out to a 17-11 lead and never looked back. The Nanooks used six kills by Megan Thigpen and seven digs from Jennifer Holland to win the set 25-18, and tie the match heading into the intermission. They out hit the Wildcats .250-.047 in the tying set. Not to be outdone, the Wildcats responded and took set three by the score of 25-19. The Nanooks committed ten hitting errors in the set as the Wildcats regained the lead 2-1. The fourth set looked to be a fight to the finish, until Alaska fell behind mid-way through the third set 17-14; however, the fight was note done as the Blue and Gold ran off eight of the next nine points to win the set 25-18 and force the deciding fifth set. Heather Lyons led the way offensively for the Nanooks with six kills and only one of the Nanooks five errors. Erica Gage also had a very strong set as she contributed three blocks and two kills. With the Wildcats holding a 9-6 advantage in the final frame the Nanooks reeled off four straight points capped off by a double-block from Megan Thigpen and Heather Lyons, to take their first lead of the set. Central Washington regained the lead late at 14-12 before the Nanooks would make their final stand. With the score tied at 14 back-to-back blocks by Thigpen and Jessica Hill clinched the Nanooks victory 16-14. Lyons led the Nanooks with a double-double (17 kills and 15 digs) and added five block assists teams 13 blocks. Thigpen (16) and Melissa Refuerzo (12) also registered double-figure kills, helping the Nanooks out hit the Wildcats .203-.094. Alexa Sherman posted a double-double with match-highs in assists (53) and digs (20). Jennifer Holland had 18 digs in the backcourt, while Thigpen chipped in 14. Four different Nanooks had five or more blocks led by junior Erica Gage with a match-high 8. Thigpen, Hill and Lyons each had five blocks in the win. Central Washington was led by Kady Try who posted 18 kills and 12 digs, while Meg Ryan and Erin Norris had 14 and 10 kills, respectively. Brandie Vea added 18 digs and Carlee Marble had 42 assists in the loss. Great win for the ladies. They have been on the verge and just came up short in the recent past and it was good for them to go out and close a game. Here are some video highlights from last nights 4-2 Nanook victory over Robert Morris University in the Brice Alaska Goal Rush. Special thanks to Jamie Schwartzwald for putting this together and sharing it. Enjoy. Also fans remember that if you have pictures that you would like to share from games or events you can send them into alaskananooksblog@gmail.com and we will try to get some up from time to time. Welcome to the Carlson Center for tonight's matchup as well see Robert Morris (0-0-0) go up against the Nanooks of Alaska (2-0-0). Alaska is coming off a steller performance last weekend beating #3 Michigan 2-0 and Mercyhurst 5-1 to win the tournament down in Anchorage. Sorry for the late start to things, would have been some sweet pictures but I forgot my cable at home, so you will have to wait until next home game. Click the jump for the action! The Central Collegiate Hockey Association announced today that Alaska sophomore Scott Greenham (Addison, ON) has been selected as the conference’s goalie of the week, for the week ending October 11. Greenham stopped 43 of the 44 shots he faced in wins over Michigan and Mercyhurst to help his team capture the Kendall Hockey Classic title for the second straight year. He made 23 stops in a 2-0 shutout victory over Michigan on Friday night and rebounded with a 20 save performance in a 5-1 victory over Mercyhusrt on Saturday night. Greenham started the season without letting up a goal in over 116 minutes of play before Mercyhurst scored a lone goal in the third period on Saturday. Greenham improved his career record to 5-0-1 while assisting on a goal in the Nanooks win over Mighigan. 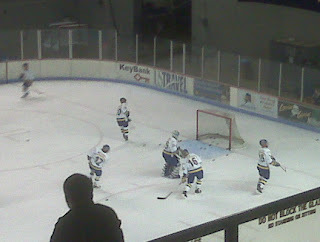 On Friday, the Nanooks used goals from Joe Sova and Chad Gehon to capture a non-conference victory. Justin Filzen, Ron Meyers and Greenham all picked up assists while Greenham turned away all 23 shots for his first career shutout. 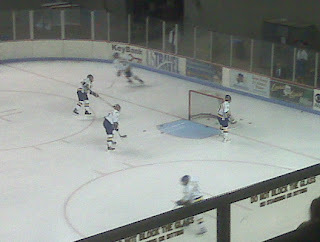 Saturday’s game saw the Blue and Gold jump out to a 4-0 lead through two period to cruise to a 5-1 victory. The Nanooks shut down the Mercyhurst power play allowing no goals on four attempts and limiting the Lakers to only four shots. Dion Knelsen tallied four points (2g, 2a) and Cody Butcher netted the eventual game winner. This is Greenham’s second CCHA player of the week award. Last season he earned CCHA Goalie of the Week for the week of October 14-20. The Blue and Gold return to Fairbanks to host the second annual Brice Alaska Goal Rush on Oct. 16-17, when Alaska Anchorage, Rensselaer Polytechnic Institute and Robert Morris join the Nanooks at the Carlson Center. Friday UAA opens tournament play against RPI at 4:05 p.m. and the Nanooks take on RMU at 7:35 p.m. Saturday the Seawolves meet RMU at 3:05 p.m. and Alaska faces RPI in the final game at 6:35 p.m. 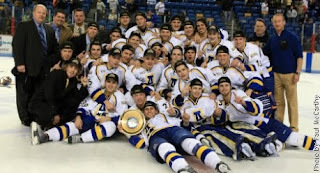 The Alaska Nanooks won their second game in as many days and captured the Kendall Hockey Classic crown by defeating the Mercyhurst Lakers by the score of 5-1. Classic Most Outstanding Player Scott Greenham made 20 saves for his second win of the weekend. The Nanooks scored the first four goals of the game before finally surrendering their first goal of the Classic at the 3:11 mark of the third period. Dion Knelsen and Cody Butcher each scored power-play goals on an extended power play in the second period to give the Nanooks all they needed for the victory. Knelsen added the Nanooks third goal of the period at the 12:31 mark for his second of the night before Ron Meyers finished off the scoring with two seconds left in the second period for the 4-0 lead. Scott Enders finished off the scoring in the third period for Alaska. Knelsen led the way with four points on the night (2g, 2a each) while Andy Taranto chipped in a pair of assists and Joe Sova and Dustin Sather each picked up assists for the Nanooks. Goaltender Scott Greenham was named the tournaments most valuable player while Dion Knelsen and Joe Sova each earned all-tournament honors for Alaska. All tournament action will be videostreamed live on the B2 Networks. 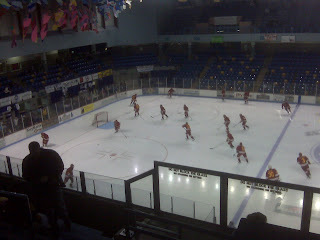 Live coverage links via video, audio and statistics are housed in the multimedia section of alaskananooks.com. Mt. McKinley Bank has agreed to renew its title sponsorship of the Mt. 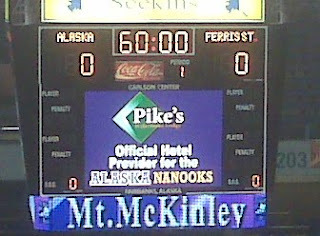 McKinley Bank North Star Invitational women’s basketball tournament hosted by the Alaska Nanooks through the year 2011. University of Alaska Fairbanks Director of Athletics Forest Karr made the announcement Thursday. Mt. McKinley’s sponsorship will give the Invitational $60,000 over the three years of the agreement. This allotted money will provide opportunities for the student-athletes to play against a variety of quality opponents from all over the country. 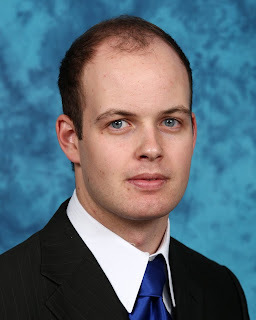 "We greatly appreciate Mt. McKinley Bank’s unyielding support of women’s athletics at the University,” said Karr. “At a time when universities are being asked to do more with less funding, Nanook Athletics needs community support more than ever. Mt. McKinley's generous sponsorship will help keep the tournament fiscally responsible in the near future." Mt. McKinley Bank has been the title sponsor for the North Star Invitational since its inception in 2001. The round-robin formatted tournament includes the Gannon Golden Knight of Erie, Pennsylvania, the Henderson State Reddies of Arkadelphia, Arkansas, the West Florida Argonauts of Pensacola, Florida, and the host Alaska Nanooks. Invitational action tips off on Thanksgiving Day (Nov. 26), when Henderson State takes on West Florida at 5:30 p.m. followed by a tilt that pairs the Golden Knights and the Nanooks at 8:30 p.m.